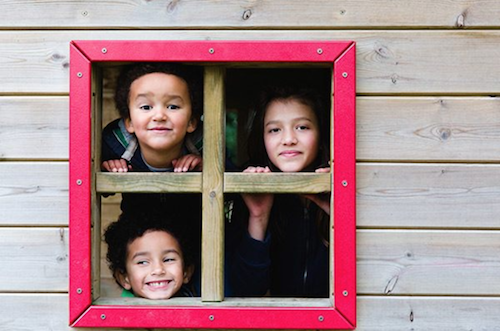 "Outdoor play is essential for the lives of children," says Heather Olsen, EdD, executive director of the National Program for Playground Safety. And while setting up a backyard playground can help motivate kids to get outside, she says, it's important to ensure that the environment is safe. According to the Consumer Product Safety Commission (CPSC), emergency departments in the United States annually treat more than 200,000 children ages 14 and younger for playground-related injuries, and about 45% of those injuries are severe. But these key tips could help protect your kids from hazards while creating the backyard playground of their dreams. Look for obstructions, obstacles, or hazards, says Nelson Morales, owner of Playground Services Inc., a Florida-based playground equipment vendor that also provides design, assembly, and maintenance services. Remove overhanging tree branches, things sticking out of the ground, and anything else that seems like a potential hazard. If your area is prone to deer ticks, lay a barrier of wood chips or gravel at least three feet wide between the edge of your yard and any wooded terrain, recommends the Centers for Disease Control and Prevention. It can help restrict tick migration onto the lawn; it's also a visual reminder that crossing into the woods may result in a higher risk of getting ticks. Remove potential hazards like split or decaying wood or protruding nails. You may need to replace wood installed before 2004; it may have been impregnated with an arsenic-laden pesticide, according to the CPSC. If you have a pool, ensure that it's properly fenced in and that you have a security gate and alarm system—many places require it by law, says Morales. He recommends keeping the play area as far away from the pool as possible. If you're setting up a playground or other structure, the best spot is a shaded location with a clear line of sight from the house. Also, try to find a place that's level. The CPSC recommends leaving at least six feet between equipment and structures, including your house, fences, sheds, trees, or poles. If you're installing swings, leave a distance equal to twice the height of the top bar. Is there a street or a stream nearby? Consider fencing in your yard to ensure safety, says Morales. If you buy equipment, says Olsen, ensure that it's right for your child's age and developmental stage. Fortunately, that's easy; the appropriate age will be labeled on the equipment packaging. Also, you don't need to spring for a state-of-the-art system to be safe, she says. Most equipment must meet the same CPSC standards for durability and safety. Buying used equipment isn't something Morales recommends, but if you do, he says, be sure you know how old the equipment is, if it's been maintained, and if it needs repair. Many playground equipment suppliers also offer installation, which means your contractor will be familiar with the equipment (or they may be able to suggest a local contractor). Another option: Pick a contractor that specializes in installing playgrounds. Once you have equipment, work with your contractor to find the right surface for your region and yard, says Olsen, like sand, wood mulch, or rubber padding. Asphalt, dirt, concrete, grass, or tile won't properly cushion children when they fall. You don't have to buy big, expensive equipment to create a fun play space, says Olsen. Save money by bringing out simple play items like balls, toys, dump trucks, and action figures—and when playtime is over, put them in storage bins so, nobody trips over them. Put out a chalkboard or whiteboard to encourage drawing, or create a reading nook by filling a kiddie pool with blankets instead of water. Olsen recommends regularly checking equipment to make sure nothing is broken or cracked, and that there are no loose hanging ropes (a potential strangulation hazard) or protruding bolts. Many contractors include maintenance visits. Otherwise, follow the safety directions in your equipment's manual. Hot days can heat equipment to dangerous levels. While plastic slides won't get as hot as the metal of yesteryear, they can still burn sensitive skin. Before letting kids loose, see if elements exposed to the sun have become hot to the touch. An adult should always be in the yard to keep an eye on kids, says Olsen. While hovering isn't necessary, it's important to be present and pay attention while kids are playing, and to be alert to potential safety hazards.